With no scheduled league matches this week we decided to have a knock up and also use it as a chance to have a look at some other stretches of the river. There had been a lot of rain earlier in the week and the river was unfishable on Thursday but with no more of the wet stuff, the river should be nigh on perfect for today. I got to the draw and a quick look at the weigh boards revealed Rob had pegged 14 and 15 at Coxes, 82 and 85 at Ashford, 95 and 96 at North Bradon and 123 and 124 at Isle Brewers. The only peg I didn’t really fancy was 123 and at the draw I hung back hoping somebody else would pull it out and when I saw young Karl had it, I stuck my hand in the hat. Two of the pegs I really fancied were 14 and 15 but they had already gone, drawn by Bruce and Heardy, then Hurf had a look at what he’d drawn and he was happy with 95, I looked at my peg and I was on 82 which is the mill pool at Ashford, a peg I’ve done well off over the years but have struggled the last couple of times I’d drawn it. Steve P had drawn 85 (The Big Bend) below me and I thought it would fish well. After driving to the river and unloading our kit we headed towards our pegs, the river looked perfect with a tinge of colour and some much needed pace. My peg is just above a cow drink and there was plenty of evidence of bovine activity (if you know what I mean!) and the ground was pretty churned up but I couldn’t see any in the field and I was hoping they’d been moo-ved on! I set up a 1 gram round bodied float and also a DH16, both with size 18 B611’s to 0.12mm hooklengths before plumbing up, the swim was a bit shallower than I remembered but I still really fancied it. The only downside of the peg is you’re sat on a high bank so for the second week running I was struggling to reach the water with my landing net, mind you with my catch rate lately, I don’t really need a landing net anymore! The start time arrived and I began with the heavier rig holding back just above a branch in the water, I had a few minnow knocks before a positive bite resulted in some blue hydro coming out and I saw a dace or chublet twisting in the flow, I was just about to start shipping back when a big chub appeared and had a look at the fish I was playing which then came off! I wasn’t too worried though as there were obviously quite a few fish there and it wouldn’t take many of those chub to build a weight. 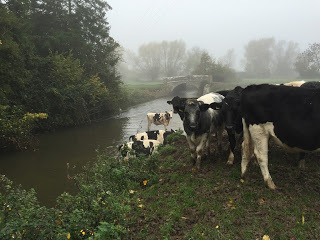 It was overcast and there was still some low lying mist around and as I looked to my left, I could see some dark shapes in the mist and sure enough it was a load of bullocks (and yes I did say bullocks!) and they were heading my way. I had a horrible feeling I was about to receive some payback for laughing at Justin last week! They crowded around me in a semi circle and just wouldn’t leave me alone, I tried ignoring them but they would then just start edging ever closer and the last thing I wanted today was a broken pole. I then tried shooing them away but they were having none of it and then around ten of them decided they wanted a drink and my swim was the ideal place to quench their thirst! I had hoped that when they’d finished they might bugger off, but no, they just resumed where they’d left off by standing there staring at me and occasionally having a pee. By now over an hour had passed with me having my back to the river and the herd was showing no signs of becoming bored, I was getting more and more frustrated as there was a great peg behind me and I wasn’t fishing it! I decided the only chance I had of getting a days cow free fishing was to move to another swim in the next field. The only peg between me and Steve was number 84 which hasn’t been used for a few years but used to do the odd decent weight when the river was up and coloured like today. So after about four trips across the field being pursued by the cows every time, I eventually got my kit over the gate and then had to walk along the edge of a ploughed field and beat my way into the peg which obviously hadn’t been fished for a long while. I was by then a sweaty mess and to be honest not really in the mood for fishing but I had to stay to the end so I could weigh Steve in. I got my box level and surveyed my second peg of the day, it looked okay but you could see the bottom through most of the peg but there was a tempting looking eddy at the bottom of the peg that looked like it might hold a few fish. 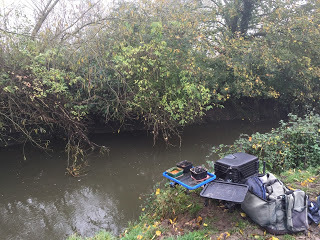 I plumbed up to find a decent depth and was soon fishing, I caught a chublet quite quickly but any thoughts of catching a few fish soon disappeared as it became obvious that there was still quite a bit of weed around and it got quite a bit shallower right across to the back of the eddy. I did add two more little chublets but it just didn’t feel like there were a lot of fish there (unlike my first peg!). Stu Alford turned up and said Bruce in peg 14 already had over a hundred fish an hour ago and Heardy in 15 was getting a few as well. He didn’t stay long as he had to start work (he’s on nights) although I reckon he could have sat behind me all night and he wouldn’t have seen me catch a fish! Nothing was going right, I put the pole down so the rig was just holding back to my right while I had a packet of crisps and when I’d finished I lifted the pole to find I was snagged up, I pulled and the rig came free, only to end up in the tree above me. I eventually got the rig back and thought I’d better check the depth again, I put a plummet on and shipped out, lowered it in and it fell off! It was time for a walk and I went down to see how Steve was getting on, his swim looked nice but it had changed a lot and was 14.5 metres across which looked like hard work, especially as he’d only caught minnows. After a quick natter, I walked back and phoned Hurf to see how he was getting on, he said he’d lost a big chub but was catching small fish so it was looking like I’d be paying him a pound later on. 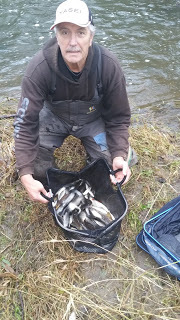 I sat back on my box and went through the motions for the remainder of the match, only adding a minnow to my meagre catch and was relieved when the end finally arrived. 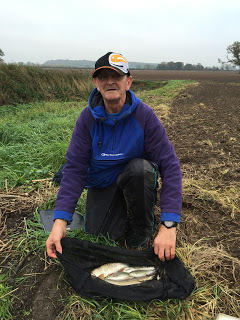 After packing up, I walked down to weigh Steve in and he’d caught a few fish late on, some lovely dace and a trout that had to be a pound and a half, he weighed 2lb 12oz in total and I waved goodbye to another nugget as my fish went a whopping 3oz! We walked back across the field to the cars and there wasn’t a bloody cow in sight! In hindsight I’d have been better off staying where I was, surely they’d have got bored sooner or later or maybe followed Stu when he turned up. Oh well, it didn’t really matter now, one thing I did know was that I was having beef burgers for tea! 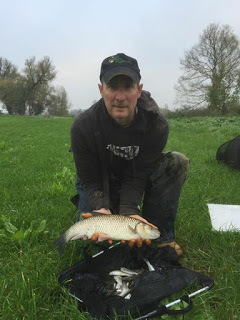 Hurf turned up and gave us a hand back with our kit, cheers mate, he’d weighed 4lb 9oz which included a nice chub and Harry on peg 96 had a few fish for 1lb 2oz but had lost a couple of big chub. 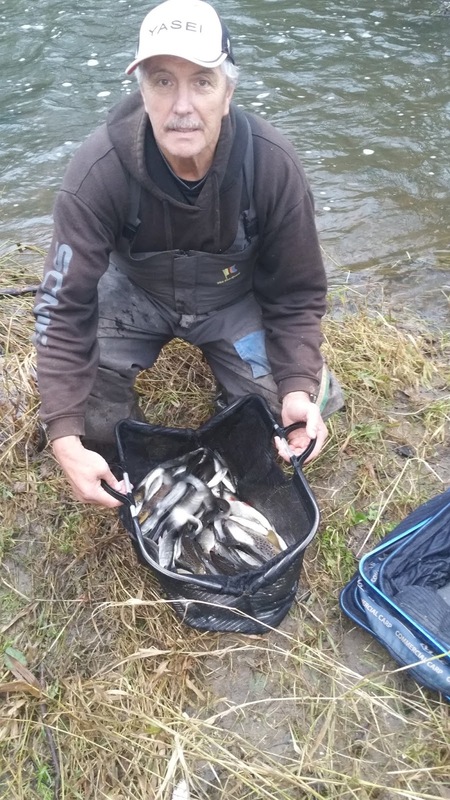 Back at the results and as expected Bruce won with a cracking net of fish weighing 12lb 9oz from the tank traps although I was quite surprised that Heardy only had 4lb 5oz from peg 15 which meant Rob was second with 4lb 13oz from 124 and Hurf finished in third place. So another bad weekend for me, it’s one thing drawing a duff peg but I’d walked away from a definite framing peg today, what a numpty! Apologies for the late blog but we’ve had problems with out heating and I’d like to say a massive thanks to Scotty Jackson who has been fantastic in helping get it sorted, cheers mate. I also missed BBC2’s The Big Fish but caught it on the iPlayer last night, they were in Costa Rica and it was the best episode yet, loads of fish caught, topped off with a magnificent sailfish, what a creature. Felt a bit sorry for Ripon who cocked up a take from a sailfish and then did it again! It probably cost him his place on the show but over the three challenges, I think it was the right choice. They are off to Canada for next weeks episode and from the trailer it looks like they catch some monsters and I’m looking forward to it (well it’s nice to see some fish being caught because I’m not catching bugger all at the moment!). What a palaver mate. You must've been hacked right off! I hate cows when I'm fishing. They always get bored eventually but I never trust em around my kit. Yes, my kit was my main worry, I just hate having to keep looking over my shoulder while fishing, think there were a lot of fish in the peg too!